Best Emoji Apps for Android and iOS Users Which Everyone Should Try! There is an old saying that “A picture is worth a thousand words” is quite in the modern world today. Since everything is going digital, the primary source of communication nowadays is messaging. When it comes to texting it’s a kind of art as you have to be supremely talented in expressing & not being misunderstood at the same time. Some people are terrific when it comes to playing with words while some are not. For those are not very expressive with words, there is an easy way to add fun & colours to your message with the help of Emoji Apps to make it more exciting and pleasing. And this easy way is nothing but using these super cool emoji apps which helps you effectively communicate without much brainstorming & makes chatting more interactive & fun. There are thousands of apps available on different platforms which are very easy to use & works fine on Facebook, Twitter, android messages, Google hangouts, Allo & other messaging platforms. Emojis are a great way to convey your emotions using various facial expressions, animals and memes emoticons. One of the best parts about emojis is that they are so reliable that even on the cross platform they are supported in messages. If you own an iPhone & sending a message to your friend who owns Android, both will see the same emoji with the slight visual difference. Most of the times we are not able to decide which is the best app for our texting needs. You need not worry as we are here to bring out the best apps for your phone be it Android or iOS. Listed below are the best emoji apps for Android, IOS & the apps which are compatible with both the OS (Operating System). KIKA emoji Keyboard app is one of the best-reviewed keyboard app available in the play store for android users. The keyboard comes with loads of fun features like clip arts, funny texting pictures, GIF stickers, animated icons & animated emotion GIFs. The GUI and user experience of the app is intuitive and smooth. It has got all the standard keyboard features like auto correct, swipe typing & prediction of words which makes your typing experience smarter & faster. Not just this it also has key sounds, different font styles, 100+ fancy keyboard themes & language option which can suit your needs. This Keyboard is available in play store for free and comes with one-handed mode and split keyboard mode. Check this supercool keyboard app to make your chatting more interesting. KIKA supports more than 60 languages and allows easy typing, theme selection, customization and font selection. It comes with more than 2000 funny emoji faces, smileys, & icons which makes you avoid boring chats & enjoy those expressive chats. Memory space: The Keyboard app takes 17.61 MB space. This is an entirely different app as it enables you to create your own emoji using your selfies. Isn’t this super cool? I am sure the people out there who love to click selfies will be pleased as they can make emoji from their selfies. 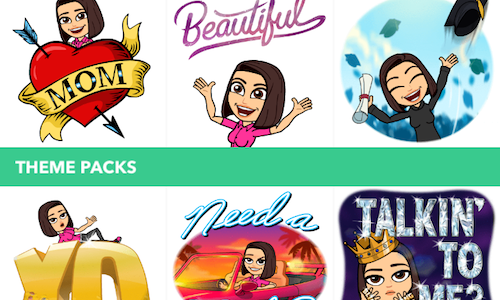 You can create over 60 differently themed stickers with just one picture customizing it through an app. You can use these stickers on social platform apps like WeChat and Line. The more impressive stickers are paid ones, but you should give it a try. Just head over to play store and create your own emoji with your selfies. SMS rage faces app something which everyone should try, & we cannot forget to mention this super amazing app on our top list. This app allows you to send amazing hand-drawn faces which have human expressions that convey messages with real meaning and makes the other person understand what you are trying to say without typing much. It comes with over 2500 GIFs, icons, memes. This app is free, and you get it from play store. 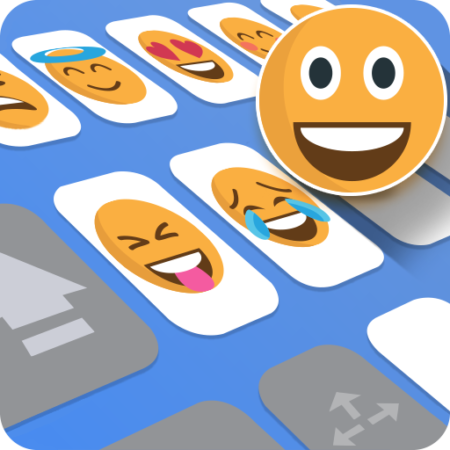 Emoji Keyboard Pro is one of the great keyboard emoji apps which gives you fully functional keyboard allowing you to customize your keyboard as per your taste. 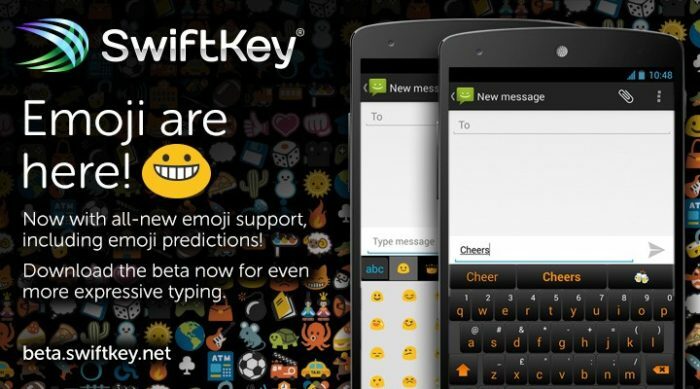 It gives you thousands of inbuilt emoji for easy integration of the keyboard with android phones. It contains hundreds of themes, and the emoji are compatible with all social media platforms and messaging applications available in android. When you are available on the internet, you can use this keyboard to search funny GIFs and use them in the app that too free of charge. Ai. 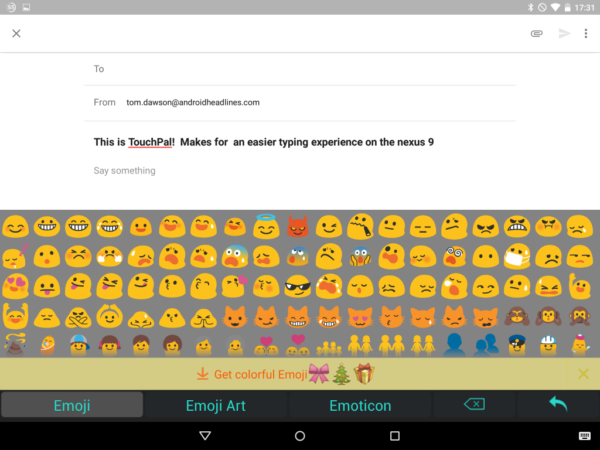 Type is a very popular and also among the intelligent keyboard emoji apps which has emoji app plugin which is readily available in the play store, context-aware features and great themes. This keyboard has scrollable UI which helps in navigating through more than 800 emoji and also has more than 1000 graphical characters. Just like Swift key, it has the context-aware feature which will suggest an appropriate emoji when you type phrases and words. This emoji plugin with Ai. Type keyboard takes your texting to another level as it has more than 2000 emoji in various categories. The keyboard makes your messaging error free as it supports Ginger for grammar checking and reasonable prediction. You can use this on any platform be it Hangouts, SMS, LINE, WeChat and Facebook and quite seamlessly and flawlessly integrates with these platforms to give you an excellent chatting experience. 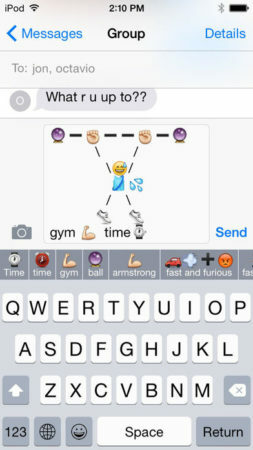 Emoji art is an app which allows the users to make modifications to the customizable list of emoticons. This app has more than 3000 beautiful emoticons, and more emoticons can be painted and put on the app. The emoticons keyboard for this app is blazingly swift, and you can use as many icons as you want while using them. Simply install the app and send these beautiful emoticons within seconds’ to your near and dear ones. I wish it were a keyboard rather than just an emoji app. It is awesome. My girlfriend loved the ones I sent her. Go Keyboard is another keyboard emoji sticker app which lets you express freely without any hindrance of typing long paragraphs. It supports various emoji, stickers and smileys and also uses inbuilt emoticons in any messaging app that you integrate with this keyboard. This keyboard lets you play with multiple themes, and the best part is you can customize them as per your mood. It has got more than 1000 themes and 100 plus cool fonts which helps you avoid boring iterations. It has word correction and voice input feature which enables you to write correct and faster. This is one of the top emoji apps for android so simply glee with this app to make your chats more impressive. This is one of the most popular emoji apps available for Android and helps you use gesture motion to type swiftly and flawlessly. If you simply want to juice up your conversations, write in style and want to stand out then use this keyboard which houses ample of emoji. This keyboard allows you to customize its shortcuts and even its appearance. It has an intelligent next word prediction and gives you accurate guesses each time when you are typing. This app is not free however you can try out the free trial and if you like you can purchase the full version. Touch Pal is another excellent application available in your play store if you are an android user. It gives you the freedom to make your chats more alluring by using tons and tons of emoji. 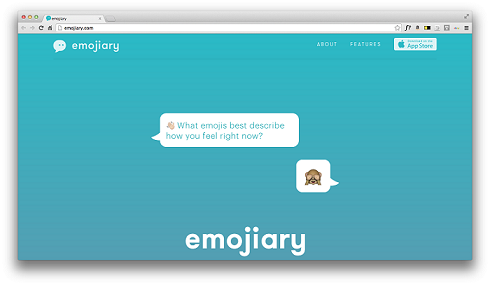 This app relies on cloud platform this app has more than 1000 smileys, emoticons and GIFs. It predicts your writing habits intelligently and keeps updating itself on that. This keyboard is compatible with other messaging apps and you can customize it as per your style and can choose from more than 400 colourful themes. This app is absolutely free and also works fine with Android Wear. Give this app a try and discover more about one of the best emoji apps available for Android. At times we all face the issue when we are looking for a perfect emoji, but we have to, scroll through hundreds of them to find out the one we are looking for. This happens to a lot of us, and this is the situation every emoji lover hates. Emoji type is a keyboard app for iOS users which shows you the exact matching emoji as you type. It keeps suggesting emoji for phrases or words and makes it easy for you to send it to friends without having to go through all of them. This application is similar to Keymoji and is solely designed for iOS users so that you can make most out of this keyboard while using WhatsApp. This keyboard also works great with third-party apps like Facebook, Twitter and enhances your chatting experience. If Keymoji is not working for you and you want an alternative to that, then you can try out this app available in the Apple store. It is available free of cost for iPhone users. You can never get the benefits of super cool emoji if you are using a regular keyboard. 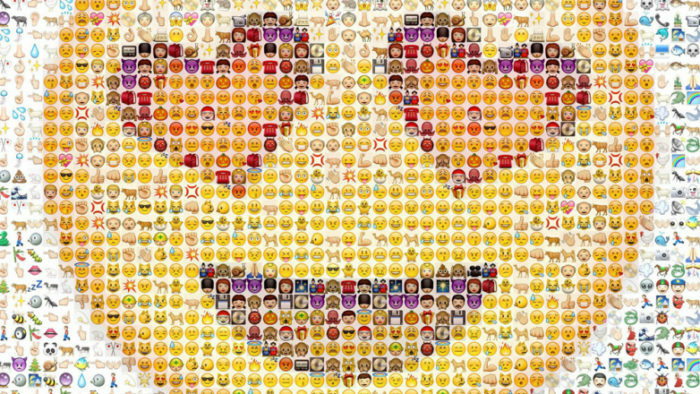 Use emoji dedicated apps and get the benefits of super cool emoji. The Emoji free app is a bit different and one step forward as it offers animated emoji art which is made from using various emoji together. You can find amusing pets, awesomely animated animal emoji, birds and cartoons on the app which can be used with other apps as well which you use on a daily basis for messaging and emailing. This app is available for free for iPhone users and brings in a vast variety of emoji choices which will surely make you fall in love with the app. If you want to add that extra oomph to your messages, then use the cool emoji fonts which are available in the app. This app has social sharing buttons which allow you to share the emoticons at any platform and has a puzzling adventure in it for added fun. Compatible with: iPad, iPhone and iPod touch. This a perfect app to customize and arrange your emoji in a suitable order to have quick access to them. Emoji is the best app for this purpose as it lets you customize your emoji keyboard, and you can put your more frequently used emoji in one place where you can access them quickly. There are different emoji packs available for this app, and you can create your own combinations of emoji and keep them saved for later use. This app keeps expanding its scope every day so that every day you get something new to use in your chats to makes them exciting and indulging. To know, How to use iOS emojis on Android, click here. This is a perfect app for emoji geeks as they would love to save their time by saving emoji and using them again and again in their chats. This app has a drag and drops feature which makes it easy for you to organize them. Add colours to your digital world by adding these fun emoji to your chats with friends and family. This app allows you to define combinations saved as per their definitions, unlike other apps. Emoji keypad is not a free app, and you will have to pay a small amount for using it. 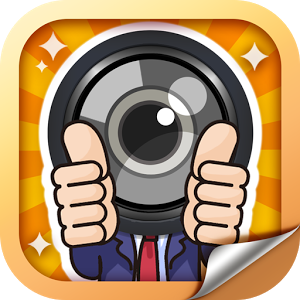 However, the cost is entirely worth it as it gives you ample of great stickers and also gives you the editing features. You can use a large combo of emoticons along with this app. You also get fancy fonts which you can use while chatting to dazzle the receivers with your elegant messages. Emoji is one of the best and most popular apps available for iOS platform and was also features on Forbes 10 of the best keyboard apps for Apple users. It already has over 50 million users who merely indicates how popular this app is. 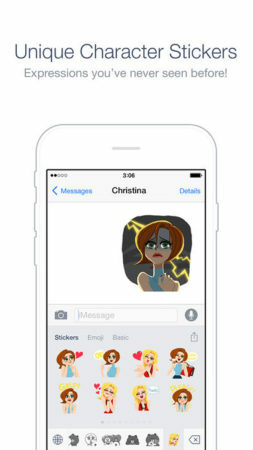 It is not just an emoji app it also offers you exciting stickers which you can use for various messaging apps efficiently. There is the endless number of expressive emoji’s featured in this app so that you can express without typing much. Simply play around with these fun emoji’s and send them to anyone via chats. This app gives you the freedom to use emoji differently. Make your WhatsApp sassy and cool with this keyboard app. Rush and download this app as soon as possible to get the amazing benefits of this keyboard. LINE is one app which is used by most of us as it is one of the most popular messaging app available in the app store. This app is majorly famous for its extensive collection of stickers and beautiful emoji which you can use in your conversations on LINE. If you are a LINE user, you must be aware of the creative and cool stickers which are available in this app. But the good news is that you can use these superb stickers and emoji in other messaging apps as well using Keyboard by LINE. This is not necessary that every time you want to use these amazing stickers you can only use them on LINE, but also you can insert these to your regular texts as well using this all-new Emoji Keyboard app by LINE. This app allows you to use stickers from LINE directory and use them anywhere in your chats. LINE also provides animated stickers as well. The only drawback with the app is that you can’t import paid stickers from LINE to use them in other chat apps. This keyboard app is a beautiful app for iOS users and comes with more than 3000 animated stickers, GIFs, character stickers and emoticons. This app sounds like minimum isn’t it? Well, not just it sounds similar to the minimum it coincidently occupies minimum space on your phone screen which is one of the striking properties of this app. This app is being featured in the Mashable 5 best iOS keyboard apps which is available for iOS platform and features a great collection of emoticons to supercharge your emoji game. In this app, you get a lot of screen space which you have to compromise with when you work with conventional keyboards. This keyboard has the auto-correction feature which allows fast typing and has a very casual and sloppy typing. This app is brilliant as it observes your writing habits and suggests you words and emoticons accordingly to autocomplete. All thanks to its quick word and emoji prediction feature. It correctly learns your typing habits and tells your typing speed. This app comes at a cost and is available at $3.99, however, a free demo version is available for 30 days. Keymoji works like a complete dictionary which has all your favourite emoticons. This app is crowd-sourced as it brings out the lot of different sources that are being updated in real time. It also brings out the most amazing emoticons for your daily use. This app is considered a favourite emoji app for iOS users especially those who are absolute emoji lovers. The best part about this app is that it phrase out the meaning of emoticons and emoji combinations to you so if you don’t have much knowledge about which emoji stands for what you can get a proper understanding about the emoji. If you’re not that emoji savvy, then this is the perfect app for you as it teaches you the exact meaning of the emoji you are using. This is how you know what exactly you are sending to your loved ones and friends. This app is brilliant & intuitive as this suggests emoji combinations based on the phrases you type to make you discover new emoji ideas which can apparently make your conversations mind-blowing. Just imagine how easy and exciting it becomes when without an effort it makes your conversations innovative, creative, smart and appealing with auto emoji suggestions. It supports messaging platforms like Twitter, Email, Notes, WhatsApp, WeChat and Facebook. Now efficiently use your emoji’s in your diary by using this fantastic app for iPhone that is Emojiary. This app is a sort of personal diary app which helps you maintain your daily thoughts and ideas but with a unique twist. If you are habitual of jotting down your daily thoughts, then this app is perfect for you. Simply use related smileys and emoticons and put down your feelings in this diary app instead of writing huge paragraphs. This app asks you general questions about how are you feeling, and you can answer these questions with emoticons to use them in future and carry on your conversations. The bot (automated tasks) also teaches you on how to use this app and gives you a walk through of the different functions of this diary app. This app is rewarding and is a great innovative and unique approach to use emoticons in your daily life. Last but not the least in our list is the sliding emoji keyboard app. This is a trial app and has a lot of useful features. It is a standalone keyboard which has a smooth sliding interface which can help you select your favourite emoji. 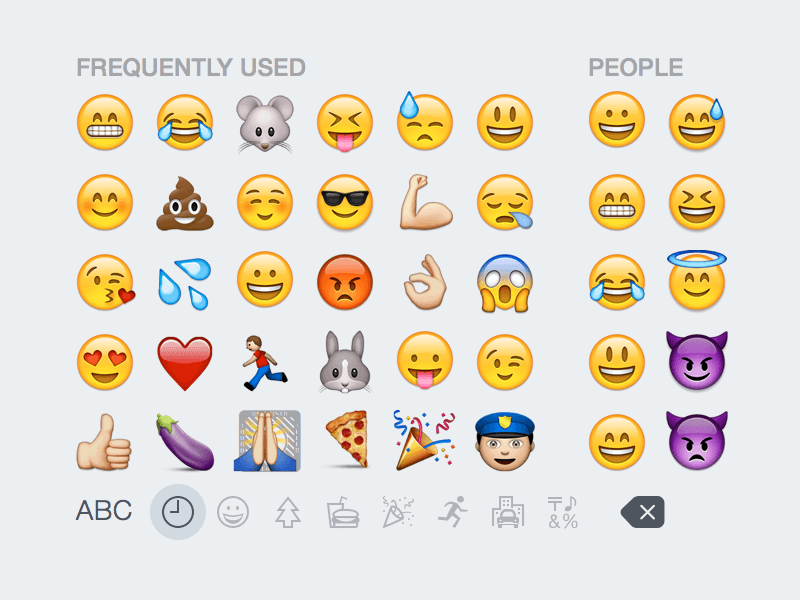 You can also create your favourite section which can have the frequently used emoji. It also has dark and light themes, and the best part about this keyboard is that you can use emoji by this keyboard even if your phone doesn’t support those emoji. While you type, they might not show in your text field however if the receiver has a device which supports that emoji, then it will be displayed on his/her phone without any errors. It is always advised to update your iOS version to enable the support of this keyboard and get the latest emoji to enjoy to the max while messaging. Quickly head over to your apple store and check this one out. It is supercooled to use. 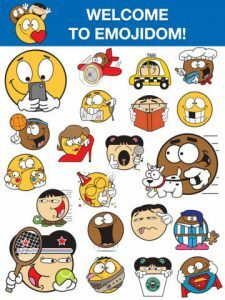 Bitmoji is an app which is available for both Android and iOS platform, and this is one more emoji application which makes your texting exciting and fun-filled. Now create your own stickers and emoji in several styles. If you want to be the rock star and want to be in the limelight in your chats, then create your own avatar emoji. The best part is that this app brings all the stickers and emoji to your keyboard and you need not roam from one app to another in search of suitable emoticons. Emoji Dom is another app available for both Android and also iOS users. It comes with more than 4000 expressive, funny emoji, smileys, and emoticons. This app can be used seamlessly on both platforms interchangeably. It is free for both platforms & a dedicated app which means you don’t need to download any keyboard to make it work. This app is ready to be used for any messaging apps like Line, Kik, WhatsApp, Facebook and many more. Emoji Dom refers to the kingdom of smileys and a perfect one for the ones who are emoji lovers. In the app store, you can find a lot of positive reviews about the app as it is easy to use and gives you a wide range of emoticons to make you chat more fun filled. There is a collection of black and Asian emoticons as well, and the emoji supports and visible on any device. The unique feature of this app is that you can create custom WhatsApp emoticons from any image to add an outstanding touch to your emoticons. Just install it without any additional keyboard, and it also offers cool packs to earn coins & groom your personal smileys collection. Rush and try this fantastic app available in play store for free. 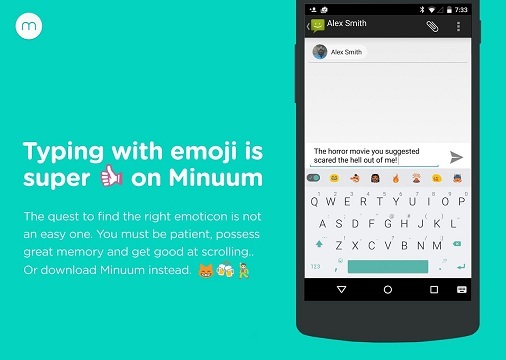 What can be better than having a dedicated app or a full-fledged keyboard for emoji? Well, the answer is Swift key keyboard app which is a specialized keyboard for Android and also iPhone users. 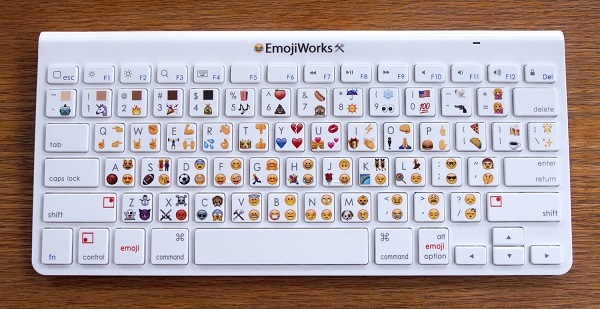 This keyboard comes with a vast selection of emoticons that you can use in day to day texting. Swift key is one of the most used & best keyboard apps available because of its jaw-dropping features, vast user-generated dictionary, suggestions & flow typing. The addition of your favourite emoji & the app suggests emoji even when you type a word is the icing on the cake. For example, if you type “let’s have a drink!” it will show a wine glass or a beer glass emoji automatically & make the other person understand what you want to say. This keyboard works as per all standards and is very stylish at the same time. It has swiping feature which makes typing much more accessible. It boasts the themes used which can be paid and unpaid both. The app has all variety of emoticons starting from the basic ones to the new ones. It also keeps track of recently used ones and keeps them in the separate section for easy use in future. It adapts as per & writing style and also gives you accurate suggestions as it comes with artificial intelligence technology which learns your emoji usage & writing style. Now forget the silly typos and switch to the faster messaging using Swift the key keyboard. Version: Android 2.3 or higher and iOS 8.0 or higher. By far this is the best keyboard app I have used. Word suggestions can be improved as it suggests word in plural format. Have you ever thought if you could make funny emoji of your friend’s face which is very good at making faces & giving great facial expressions? You need not wish anymore as you can quickly do it on your smartphones. Just install the Imoji app, create your stickers, emoji & share these self-created emoji to your friends & families via messages. The messages & emoticons are known as stickers, & you can use the picture of a face to have a more intimate touch to your messages. This app is perfect for the ones who want it gives a personal touch to their emoticon stickers. The only drawback of this app is that it is a standalone application & instead of sending these stickers via other messenger apps you will have to rely on this app for messaging. There is a built-in messenger which can be used to send these stickers. This built-in app may not be as feature-full as the existing messaging apps like messenger, WhatsApp etc. The best part is that this app is available for both IOS and also Android devices. There is no limit on emotions being expressed, & you can make many stickers in Imoji as per your expressions and needs. Just pick up any picture from your gallery and give colours to your creativity. Give it a try and enjoy messaging. Availability: Free for both Android and iOS users. I have had this app for about six months and didn’t see any issues with it. My friends love it when I send them a new sticker every time. I would recommend this app to all. 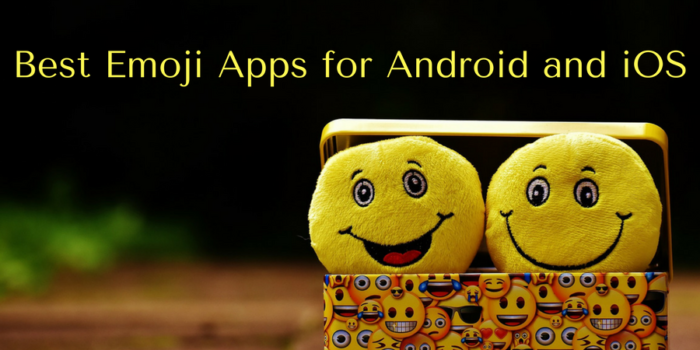 Listed above are the apps that should be more than enough to satisfy your emoji needs, & there are many bonus services which come along with these apps helping you to take most out of these smileys & emoticons. Hope these will be helpful and also help you improve your chatting experience. They are incredibly user-friendly and also convenient to use.